Soak cornhusks in hot water until softened. Cream the lard until light and fluffy. Mix the masa harina with baking powder and salt, and beat into the lard in small amounts. Beat in stock to make a soft paste. The dough should be soft and pliable. To test the dough you can place a small amount in water, if it floats it is the right consistency. Shake excess water from cornhusks. Spread 1 tablespoon of the dough on the center of cornhusk. Leave room to fold over the top and bottom edges. Add 1 tablespoon of the filling. Fold cornhusk and dough over the filling so that it is completely covered. Fold the top and bottom. 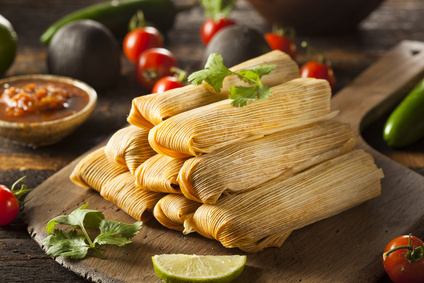 Arrange tamales over the steamer rack stacking loosely to allow for the dough to expand. Tamales should not come in contact with the water. Steam for about an hour or until dough comes away from husks when unrolled. Fillings Tamales can be filled with all sorts of meats and condiments and sauces. Meat should be always boneless and shredded. Fillings have to be cooked beforehand. Tamales Verdes are made with chicken in a green tomatillo sauce. Tamales Rojos are made with pork and mole sauce. Tamales con Rajas are made with sliced poblano peppers, and manchego or mozzarella cheese.